PRINCETON, N.J.–(BUSINESS WIRE)–NRG Energy, Inc.’s (NYSE:NRG) philanthropy program – NRG Global Giving – joined forces with Haitian solar company DigitalKap to unveil two newly installed rooftop solar arrays at Haitian non-profits Les Centres GHESKIO (GHESKIO) in Port au Prince and Sustainable Organic Integrated Livelihoods (SOIL) in Cap-Haïtien. Both organizations received systems that total 20kW. The respective systems, made up of nearly 120 photovoltaic panels, will generate 100% of the electricity usage for SOIL’s operations and 70% of the electricity usage for GHESKIO’s Family Nutrition Center, in the form of clean, renewable electricity from the sun. GHESKIO is an outstanding example of community-based health care. Developed in response to the AIDS epidemic that began in the 1980’s, GHESKIO’s services have expanded to meet the health care needs of Haiti’s most vulnerable. “We have huge needs for electrical power. We have a 400 KW power generator running all day to support the entire complex. 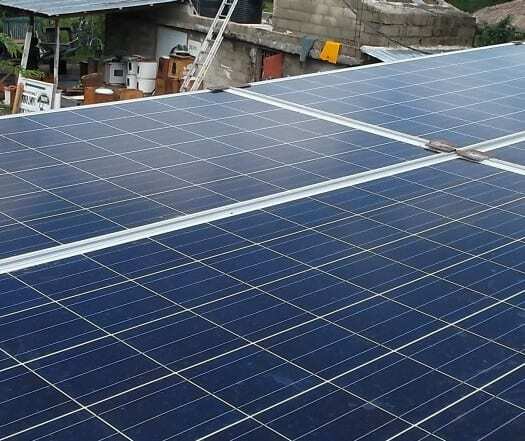 However, it reached its limits and the new Family Nutrition Center could not be supplied by the existing power generator, this is why the 20 KW solar installation NRG donated is important,” said Dr. Jean William Pape, MD, Director, GHESKIO. SOIL works to promote use of ecological sanitation (EcoSan), a process by which human wastes are converted into valuable compost. “SOIL is incredibly grateful for the beautiful solar panels that power our office and compost site in Cap-Haïtien, Haiti. The addition of sustainable solar power has truly transformed our space – we no longer work alongside the loud buzzing of our generator and we do not fret when city power is irregular. The SOIL team can work in a consistently functional, beautiful, and environmentally friendly space. We cannot thank NRG enough for their support – we appreciate it every day!” said Molly Case, SOIL’s Deputy Development Director. Read the full Press Release, and check out SOIL’s blog about our amazing solar power capabilities! 2 Replies to "Business Wire: NRG Partners with DigitalKap to Bring Solar Power to Haitian Non-Profits, GHESKIO and SOIL"
Hello, my daughter, Kathene is in Cap Haitien with a small group of people from YWAM (NGO), and their objective is to set up a base from where they can distribute service to the local people in their area. A few weeks ago, Kathlene indicated that they were planning to distribute water filters. Kathene is a medical doctor and I would think she would at some stage look at setting up medical clinics in the area. One of the problems that there are facing is the lack of power. The group is having to us a portable power generator a few hours a day to power their equipment. They have mention the possibility of building a solar power unit where they are. If they do go a head with a solar energy project would your organization be able to assist them? Thanks for reaching out. As an organization we don’t do work to install solar panels, but if you reach out to me at nmiller@oursoil.org, I’d be happy to try to get you connected with people that do.